Here at Camuso CPA, we offer cryptocurrency tax services in Charlotte. Cryptocurrencies are an exciting new currency medium that is fast gaining popularity. However, as a new monetary medium, there is a lot of grey area come tax season. The last thing any good investor wants is to be scrutinized by the IRS, and that is fast becoming a real possibility as cryptocurrencies become more mainstream. Here, we will go over why many people haven’t yet reported their cryptocurrency transactions to the IRS, and why they should. Why haven’t people been reporting their cryptocurrencies? According to the personal financial service Credit Karma, only about 0.04 percent (or 100 citizens out of 250,000) of United States citizens reported their cryptocurrency transactions to the IRS as of February 13. The Tax General Manager of Credit Karma, Jagjit Chawla, did not express surprise at this low number, stating that people with more convoluted tax situations (like those performing cryptocurrency transactions) generally file later in the season. However, he added that the numbers did seem low considering how mainstream cryptocurrencies have become. Back in March of 2014, the IRS began providing some guidance for the taxation of Bitcoin, one of the most popular and mainstream cryptocurrencies. Because of these guidelines, cryptocurrencies are treated as property rather than currency. Like all taxed property, when you report cryptocurrency to the IRS, what you owe will be based off of the price you bought it at, the price you sold it at, and the change in value between when you bought and sold it. Many experts believe this is not the ideal designation for cryptocurrencies, and may even become a deterrent in their adoption. Trader Brandon Williams, for instance, told CNBC that he thought it would be better to treat cryptocurrencies as currency. 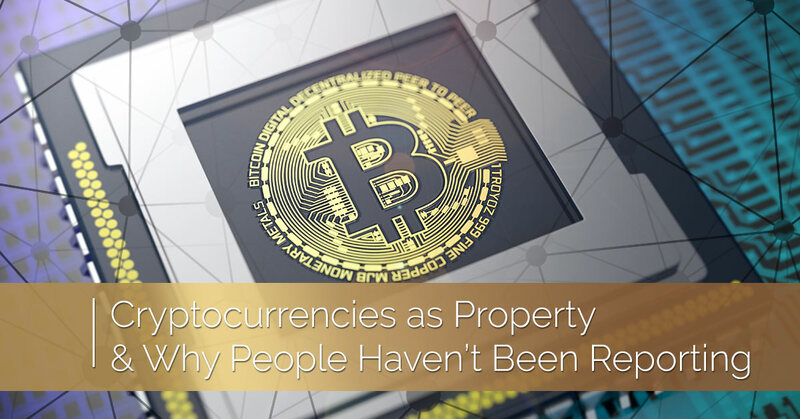 In fact, Williams also argued that the small amount of cryptocurrency traders who have filed them in their taxes is due specifically because of the difficulties of treating cryptocurrencies as property rather than currency. For instance, he states that if a person makes more than two trades a day, they can expect to spend three to four hours every two weeks just tracking gains and losses while taking into account volumes and volatility. If you are looking for qualified crytpocurrency tax services in Charlotte, Camuso CPA can help! Please feel free to give us a call for more information about our cryptocurrency and other tax services. One of our friendly and knowledgeable representatives will be happy to answer any questions that you may have. We look forward to hearing from you!